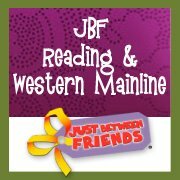 This morning I had the chance to browse and shop at the Just Between Friends – Reading and Western Mainline presale at the Greater Philadelphia Expo Center in Oaks, PA along with several other area bloggers from Philly Social Media Moms. Talk about unbelieveable!!! With over 700 consignors, this sale is jam packed with everything from toys to books to clothes and shoes, baby gear, snow gear, sports gear, crafts, puzzles, games and more. You name it – you are likely to find it here! This is one sale you will not want to miss. There is a $3 admission fee for the first day of the sale only, but you can head to their website HERE to print a free pass. Sale starts tomorrow Thursday September 13th and runs through Saturday September 15th (many items are marked to half off on Saturday). For a full list of dates and times go HERE! The deals are just incredible! This sale accepts cash, debit and credit cards (no checks). Wear comfortable shoes – this place is huge and you will be spending a lot of time on your feet! Bring along several large totes to carry your goodies. Thirty One Organizing Utility Totes and large reusable bags work great – or bring a laundry basket tied to a string or belt to drag along behind you. When deciding on whether something is worth buying for the listed price, think about how much it would cost to purchase new (on sale) or use your iPhone to check online prices for similar items on Ebay, etc. Happy Shopping! If you go, be sure to let me know about what you find! I was so thrilled with all of my finds. I was able to purchase snow boots and snow pants for both kids, a beautiful holiday dress for my daughter as well as several outfits, dress shoes to match my daughter’s dress and a pair of Ugg- like boots. I literally could have spent the whole day shopping – this place blew me away! I know I will definitely be heading back in the spring to shop again. It is well worth the trip for me (and I may even convince a few friends to come along)! Disclosure: I was invited to shop the Just Between Friends Reading and Western Mainline presale along with other PSMM bloggers; I was given a swag bag with a gift card to use toward my purchase at the sale. All opinions are, as always, completely my own. Oh very nice consignments! Great to purchase low cost babies & womens consignments at the best rate! Louis Vuitton & Gucci are the best brand to choose! Most of the Consignments are gently used.